CAP-002-01-00 2 Pin, Closed top passive SMT component socket for 0603 imperial, 0201 metric 0.80mm thick package. CAP-002-02-00 2 Pin, Closed top SMT passive component socket for 2 Pin, Closed top passive SMT component socket for 0805 imperial, 2012 metric, 1.45mm thick package. CAP-002-03-00 2 Pin, Closed top passive component SMT socket for 0805 imperial, 2012 metric, 0.90mm thick package. CAP-002-04-00 2 Pin, Closed top SMT component socket for 0402 imperial, 1005 metric 0.51mm thick package. 1.9mm (0.75") Pitch on one side. Single center contact on the other side. 12.54mm (0.10") Pitch on one side. Single center contact on the other side. Through hole pins with center PCB locating stud. 3.1mm (0.122") Tab Single contact centered on one side. 2.3mm (0.091") Pitch on the other side. 1.9mm (0.075") Pitch on the 2 pin side. 04335-121-6218D 5 Pin Closed top Kelvin connection socket for SC70 MO-203 Small Outline Transistor package. No IC alignment rails inside the socket. Fits odd sized or extra wide IC plastic body. 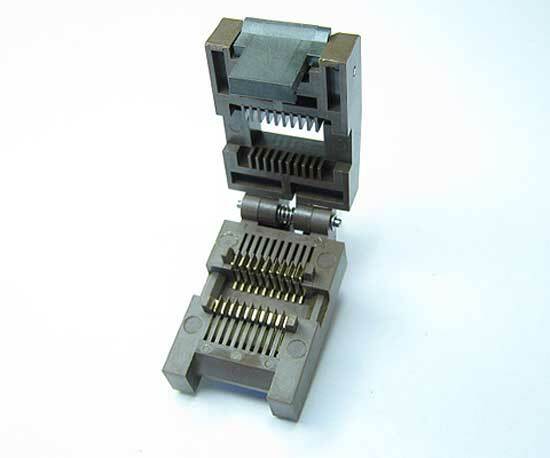 652B0162211E-002 16 Pin Open top, SOP type package test socket with extra contact retention force. 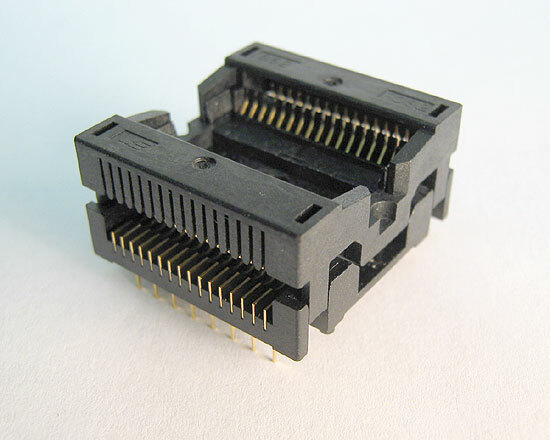 IC107-3204-G 32 Pin SOJ open top, live bug, small outline J-Lead package test socket. 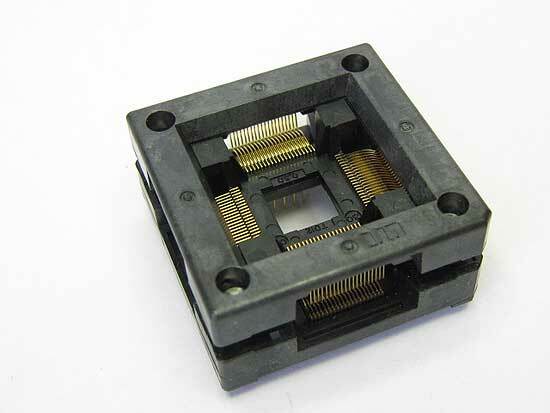 IC120-0324-309 32 Pin open top, live bug, square PLCC package test socket. 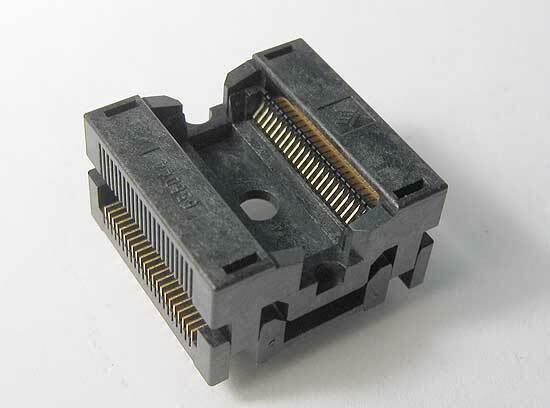 IC160-0324-200 32 Pin PLCC Surface mount open top production quality socket. Package of 10. 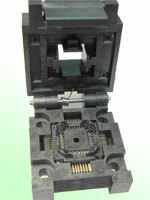 648A0402211-A01 40 Pin Open top, TSOP Type 1 type package test socket. This socket is obsolete. We have 5 left in stock. 44QN50S17070 44 Pin Closed top test socket, QFN package test socket. 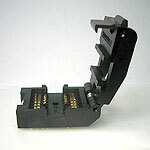 The previous version of this part number was 44QN50TS17070. 678-3444211 44 Pin HSOP package test socket by Sensata. This socket does not have the heat slug IC bottom contact. 678-3444211-001 44 Pin HSOP package test socket by Sensata. This socket hasthe heat slug IC bottom contact. 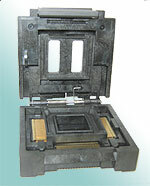 FPQ-52-0.65-04 52 Pin Closed top test socket, TQFP package window lid test socket. Same as the FPQ-52-0.65-01 except it has a window in the lid. 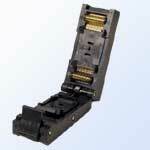 790-62056-101 56 Pin Open top test socket, QFN package test socket with additinal, 57th center body contact. 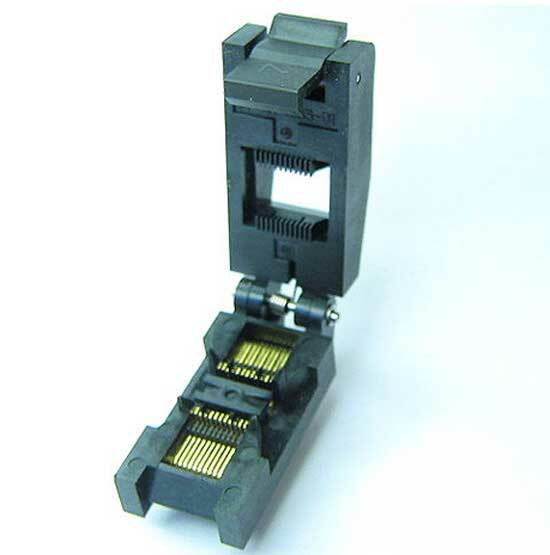 03734-571-6218A 56 Pin Closed top test socket, QFN package test socket with additinal, 57th center body contact. 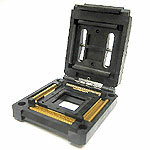 FPQ-80-0.08-02 80 Pin Closed top test socket, QFP square package test socket. FPQ-80-0.08-12 80 Pin Closed top test socket, QFP package test socket. 3012-080-06-08 80 Pin Open top, QFP package test socket. Previous part number was 7012-080-06-08. FPQ-100-0.5-11 100 Pin Closed top test socket, QFP package test socket. 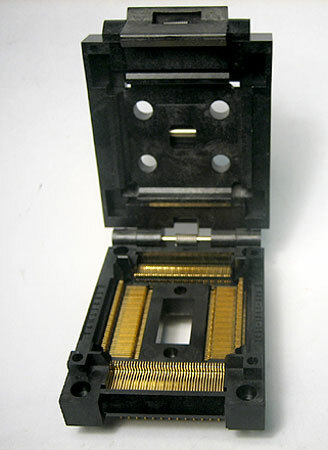 IC234-1004-45-N 100 Pin Open top type TQFP package test socket. "-N" Means no plastic locating pin. 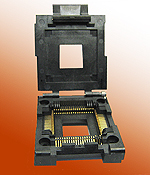 IC357-1004-053P 100 Pin Open top type TQFP package test socket. 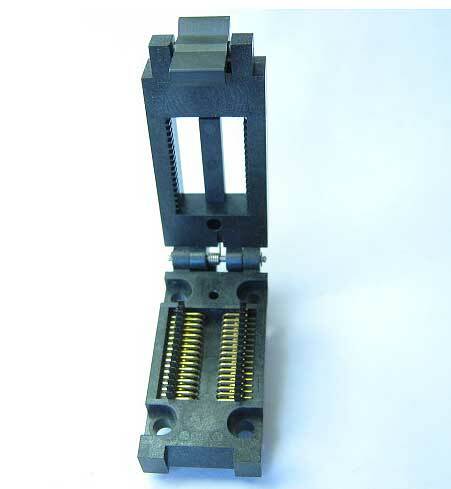 3014-100-6-08 100 Pin Open top, QFP package test socket. Previoius part number was 7014-100-6-08. FPQ-120-0.8-03 120 Pin Clamshell closed top, TQFP package test socket. 3014-120-6-48 120 Pin Open top, TQFP package test socket. FPQ-128-0.8-05 128 Pin Closed top test socket, TQFP package test socket. IC51-1324-828 132 Pin Closed top test socket, QFP package test socket. FPQ-1364-0.8-01 136 Pin Closed top test socket, TQFP package test socket. FPQ-144-0.65-01 144 Pin Closed top test socket, TQFP package test socket. 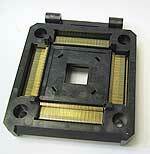 IC51-1444-1014 144 Pin Closed top test socket, QFP package test socket. 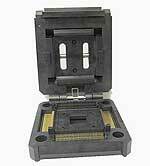 IC51-1444-1354 144 Pin Closed top test socket, QFP package test socket. IC51-2084-1052-NL 208 Pin No top socket, TQFP package lidless socket. Commonly used for automatic testing.